In the eleventh hour, when all seemed lost, as the Tigard football team's tyrannical defense kept planting Will Spitznagel into the turf and the fourth quarter began to fade away, Jesuit refused to fold. Collectively, this is a Crusader bunch that's battle-tested and conditioned to weather the harshest of elements. The grueling, sweat-drenched three-and-half hour practices in the summer, the limitless amount of gassers up a God-forsaken hill adjacent to Cronin Field every Monday, the crack-of-dawn morning lifts as a team. It's all work that nobody sees but refuses to give Jesuit credit for. The Crusaders are constructed to endure. And staring down the barrel of a 22-10 fourth-quarter deficit in the Class 6A quarterfinals to a Tiger team that was both surefooted and seemingly destined for a semifinal date with Lake Oswego, Jesuit, not by luck or chance but by grit and guile, survived. Down 22-17 with just over five minutes to go in the fourth quarter, Spitznagel piloted a 13-play, 59-yard drive down to the Tiger 1-yard line. 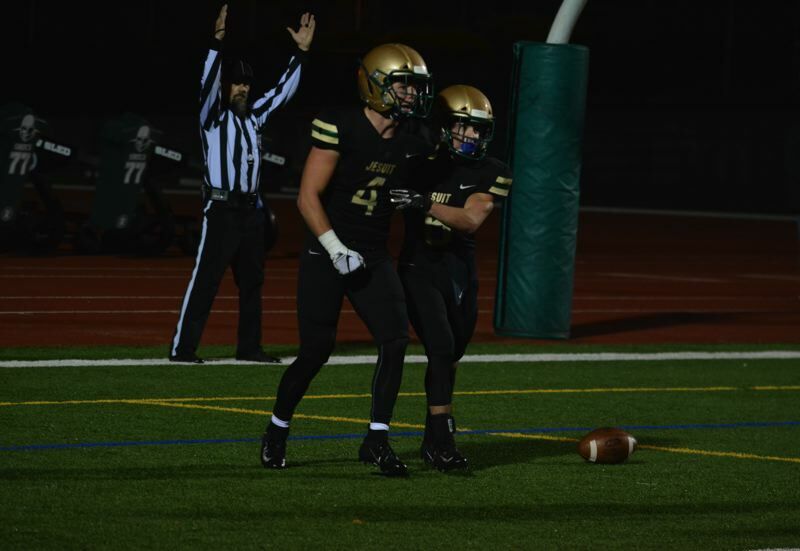 And on a fourth-and-goal from inside the Tiger 1, after the Tigard defense doggedly kept Jesuit out of the end zone on the three plays prior, Spitznagel followed his center Seth Monahan up the middle and snuck into pay dirt to give Jesuit a 23-22 lead with 19 seconds left in the game. Tigard got the ball back at its own 20, but sophomore quarterback Drew Carter was sacked by Jesuit junior linebacker Lucas Christen back at the Tiger 4. 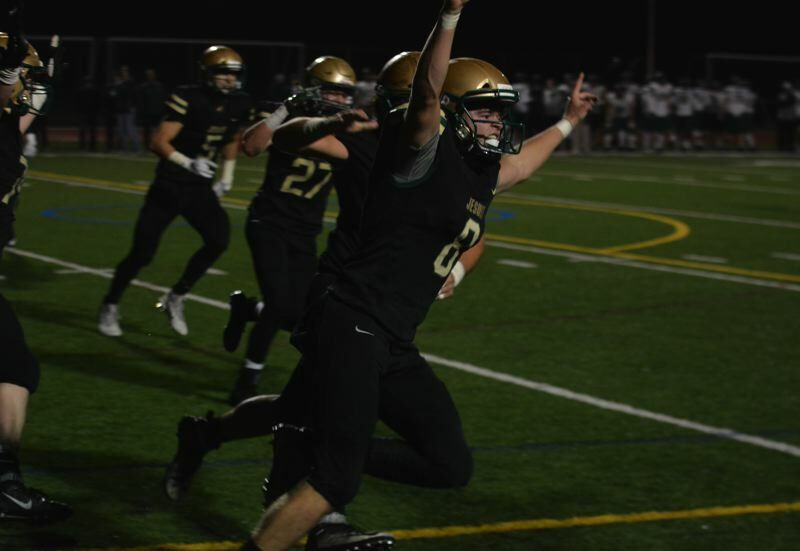 And the Tigers' last-gasp pass on the final play of the game was picked off Crusader junior cornerback Seth Welsh, setting off a wild Jesuit celebration on the sidelines and sealing a 23-22 win at Jesuit High School on Friday night. "This team has no quit, it's something special," Jesuit senior lineman Joe Quillin said. "We do it for the people who came before us, we do it for us. Credit Tigard. They're a great team with some great players. But when we do conditioning on that hill over there, that instills a blue-collar mentality. People say we're just a bunch of rich kids. (Tigard's crowd) was chanting 'Daddy's Money' at us. But we put in the work more than anyone. We're proud of it. We take ownership of that. We hold each other accountable. We have no quit in us." No. 4 Jesuit will take on No. 1 Lake Oswego in the 6A semifinals at noon next Friday at Hillsboro Stadium. "We faced adversity and showed a lot of heart," Spitznagel said. "We have a lot of faith in our teammates, our coaches, our brothers. We came out here and finished the job off. I think it shows a lot about the belief we have in ourselves." Openly, Tigard must have taken a toll on Jesuit's team-wide credence the way the Tigers came storming out of the gate in the first half. Junior cornerback Max Lenzy picked off a deep Spitznagel pass on the first drive of the game, a takeaway Carter converted into a nine-yard touchdown pass to Flecher Ahl to go up 7-0. Following a three-and-out, Tigard senior running back Malcolm Stockdale scampered around a wave of sealed-off blocks by the Tiger offensive line for a 20-yard touchdown run to extend the lead to 13-0 with 3 minutes and 13 seconds left in the first quarter. "We just knew it was going to be a physical game, and we tried to out-physical them," Ahl said. "We did for a while, and we fought to the end. I'm just proud of my teammates. We fought to the end. We came together, and we love each other." 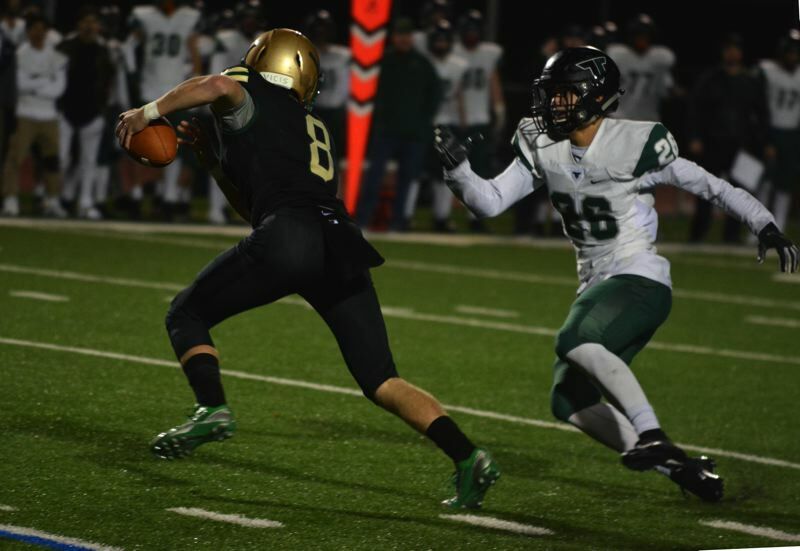 Tigard's defense came at Jesuit with no fear but full-out force. Seniors Noah Jackman, Jazz Ross, Isaia Porter, Mitchell Cross and Carter Dennis led a head-hunting, bone-rattling front seven that forced a Crusader fumble at the Tiger 1 in the first quarter and held Jesuit to a short field goal after yet another goal-line stop in the second quarter that made it 13-3 with 9:26 to go in the half. Spitznagel responded with a 34-yard touchdown pass to Josh Daul that brought Jesuit within 13-10 with 3:15 to go. "It was intense, we played hard the whole way," Carter said. "It was a tough game, but we gave it our all. We played Tigard Football. We really wanted to win this game, but we came up just short." And just before the half, Carter lofted a beautifully thrown ball down Luke Ness, who caught the rock, wrestled away from a Jesuit defensive back and hoofed it to the house for a 69-yard touchdown pass. However, the referees ruled Ness pushed off on the play and flagged him for offensive pass interference, nullifying a score that would've put Tigard up double digits going into the half. Instead, the Tigers settled for a 13-10 advantage at the break. The second half started perfectly for the Tigers, too. Stockwell gashed the Jesuit defense while Carter and Ness linked up for a pair of big passes that led to a 22-yard field goal from Jackson Cleaver just three minutes into the third. Then Spitznagel threw his third pick of the game to Lenzy inside Jesuit territory. One Lenzy 34-yard run later, Carter executed a textbook play-action back to Stockwell, spun around and dumped off a 4-yard touchdown pass to fullback Cole Scott. The following two-point try failed, but with 6:27 left in the third, it felt like Tigard was in total command, leading 22-10 with all the momentum and all the gusto to go for Jesuit's jugular. Yet, the Crusaders didn't cower, even after the Tigers forced back-to-back three-and-outs to close out the third quarter. "It wasn't uncharted territory for us," Quillin said. "It's a situation we were in against Sheldon. We knew we had to keep our heads up. It could've been the last game of our careers, but our mindset was we couldn't lose." Jesuit's defense, after struggling at times to counter Tigard's offensive balance in the first three quarters, carried its weight immensely in the fourth. First, the Crusaders, facing a 4th and 8 from the Jesuit 36-yard line, forced an incomplete pass from Carter to turn the ball back over on downs with 9:44 to go in the fourth. 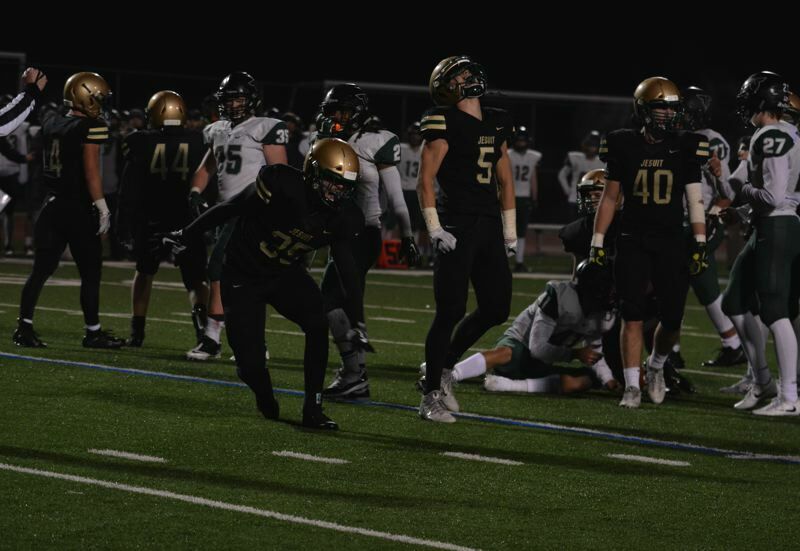 And Spitznagel sprung to life, connecting with Daul on gains of 32 and 16 yards as well as a key 14-yard to Colin McMahon to put Jesuit inside the Tigard 10. The Tiger defense, so tough and rugged around the goaline all game-long, forced Jesuit into a 4th and goal at the Tigard 7, but Spitznagel calmly dropped back and fired a quick slant to Daul, who beat Lenzy off the line of scrimmage, separated and speared the rocket for the all-important touchdown to bring Jesuit with 22-17 with 7:01 left in the fourth. Spitznagel threw the ball 10 times on that critical drive, completing four crucial passes that kept Jesuit alive. "That was something different, but I'm willing to step up for my team and do whatever I need to do to get a win," Spitznagel said. The Crusader defense again came up clutch, coercing a key three-and-out on the next possession, highlighted by a big Tom McBratney/Andy Alfieri tag team sack on third down that forced a Tiger punt to set up the game-winning drive. Initially, it seemed like Tigard stemmed the momentum. After Jesuit running back Teddy Atkinson ripped off runs of 11 and 13 yards to cross into Tiger territory, the Crusader march that began at their own 41 stalled at the Tigard 40 yard-line, setting up a 3 and 15. Yet, after absorbing an evening full of big hits, through-the-whistle roughhousing and an overall punishing from the Tiger defense, it was Spitznagel who landed the deciding blow. The Metro Offensive Player of the Year couldn't find anyone open on third-and-long, so he escaped the pocket and took off down the left sideline. With the first down marker seemingly out of his reach, Spitznagel decided against stepping out of bounds and instead lowered his right shoulder into the chest of a Tiger defensive back and truck sticked him back five extra yards for a 20-yard gain and the gigantic first down. "I've been doing that all season, some haven't gone as well as that, but I kind of delivered the blow," Spitznagel said with a smile. "That one felt good." "Will is one the toughest guys I know and he refuses to slide," Quillin said with a smile. "We gave up a lot of sacks, but he makes up for it with his athleticism and he's just a great player." 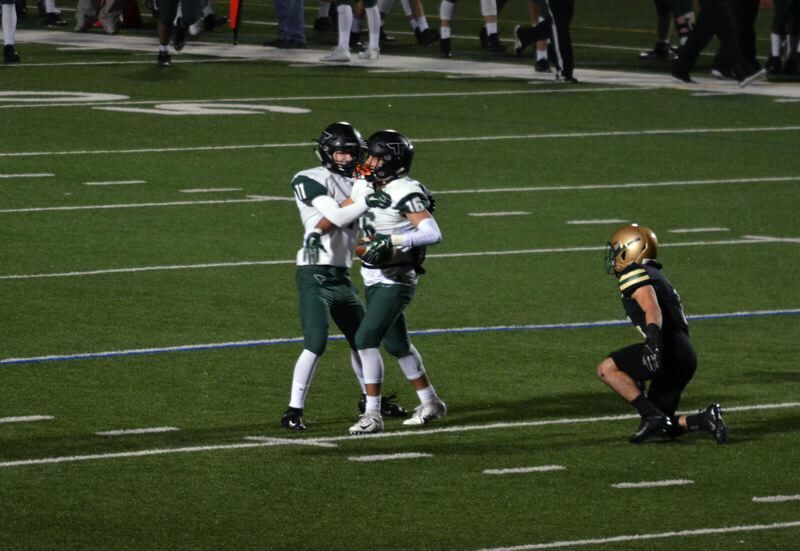 Tigard was called for defensive pass interference on 3 and 8 from the Tiger 18, giving Jesuit the ball at the Tigard 9 yard line. However, backed into a corner yet again, the Tigers held. Jesuit junior Kade Wisher's four-yard run moved the Crusaders closer, but Tigard stuffed Atkinson shy of the end zone twice in a row. And on 4th and goal from the Tiger 1, Ross tackled Alfieri short of the end zone, but the referees blew the play dead, calling Tigard offsides before the play could get off. With the ball placed inside the Tiger 1, Jesuit lined up two fullbacks in front of Alfieri with Spitznagel under center. It appeared the Crusaders were going to burrow some sort of hole for the long-legged Alfieri to leap into. Instead, Monahan, Quillin, Shea Brooks and Declan Quillin shoved ahead and made just enough room for Spitznagel to dive through a thicket of Tigard defenders across the goaline for the go-ahead and ultimately game-winning score. In the fourth quarter, when courage and conviction were required, Jesuit had enough strength and enough gas in the tank to finish. Thanks to its indefatigable, industrious work ethic, Jesuit put itself in position to pull out what many felt was an improbable fourth-quarter comeback. "That makes or breaks our game," Daul said. "If we don't do hills, we don't have enough strength to do what we did there, to get that extra one-yard push." Lenzy had three picks for the Tigers while Cross had a team-high nine tackles. Carter had the two touchdown passes and Stockwell ran for 95 yards and the 20-yard score. Tigard held Jesuit to just 115 rushing yards on 40 carries. But Spitznagel went 13-for-22 passing with the two scores to Daul and the game-winning one-yard quarterback keeper. Tigard finished its season with a 10-2 record.